Weiss didn’t even look remotely interested in his post-game interview. He was speaking like he wanted to get home in time for the season six premiere of Game of Thrones. There is a difference between projecting a sense of calm and confidence in tough times and merely summarizing how the Rockies dropped a three-run lead in the ninth after coming back from an early 7-1 deficit. Weiss seems to have missed Bryce Harper’s initiative to make baseball fun again. The Rockies were within one out of being just a half game back of the best team in the division. Instead, the Rockies are 2.5 games back, sitting at .500. It could become very easy to dwell on the fact that they could have won the series against the best team in their division. 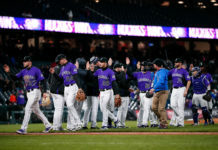 Moving forward, though, strength will have to come from the enthusiasm and dedication of the players, like CarGo jumping in the stands to try and get his team an out in the ninth inning, where outs were so difficult to come by. Thankfully Jon Gray didn’t get the loss in his season debut, because overall he pitched a good game, and it was encouraging to see him look healthy on the mound. First-game jitters seemed to be the problem here, as Gray gave up three runs in the first inning. 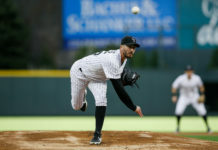 He went on to record a career-high 10 strikeouts and the bullpen didn’t give up another run the rest of the game to give the Rockies a chance of coming back from the two deficits. 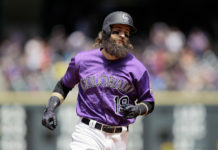 Brandon Barnes asserted himself in this series and should be a big consideration as the fourth outfielder, even when Charlie Blackmon returns from the DL, going forward. Can you imagine if the Dodgers still had Zack Greinke? Kenta Maeda would be the third starter in the Dodgers rotation. Maeda is making the departure of Greinke a little easier to swallow, as the righty is 3-0 with a 0.36 ERA to start the season. Chatwood was poorly matched at home for the second time this season, and the Rockies really didn’t have a chance the whole game, as Maeda went more than two-thirds of the night without a hit. This game echoed the theme of poor starting pitching and great relief pitching. The only reason this score was as close as it was, is because of the bullpen. 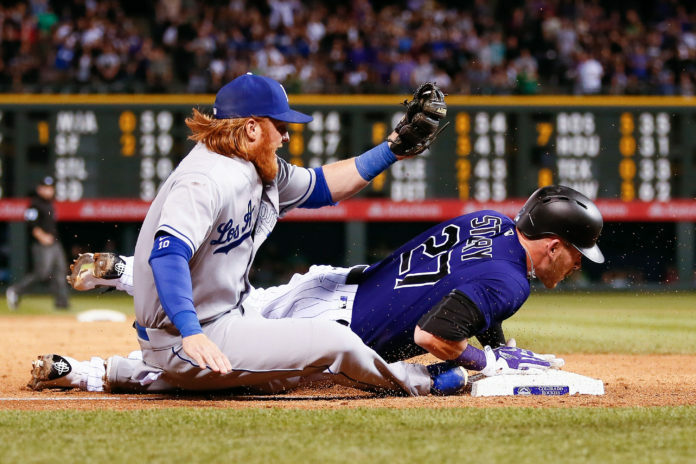 Jordan Lyles and the Rockies deserved the loss in this one, but so did the Dodgers, as both teams seemed to do everything they could to throw this game away. Lyles didn’t make it through the third inning as the Rockies were down 7-1. Unfortunately, it probably would have felt better if the Rockies lost by this score and got destroyed, rather than coming back only to blow a three-run lead in the ninth. With the calamity of errors and walks in this game, it was difficult not to be reminded of the game at home against the Brewers two years ago in which three runs scored on one passed ball. Like that game, it seemed like the Rockies were doing everything they could to lose. Hopefully, unlike the Brewers game, this doesn’t become a point in the season that summarizes the team’s futility. The irony is that the bullpen pitched great (aside from Jake McGee), and the team showed that they can come back from anything. Remembering these efforts will be the best way to move forward after a “tough” series.